Welcome to our trophy and award page. Throughout this page you will see examples of our trophy and award portfolio. 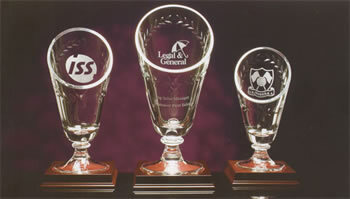 Crystalcraft has been commissioned over the years to design and manufacture many exciting and prestigious trophies. Apart from our totally unique bespoke service our clients are able to select from a wide range of ‘Off the shelf’ trophies in both Optical and Plain crystal each individually engraved and personalised. To name but a few. If you would like our 64 page full colour brochure or more information please click on Contact Us.